USDA BioBased Certified and GSA approved Cleaner, Lubricant and Penetrating Oil. Non-hazardous, Anti-corrosive, Non-flammable, Non-toxic and Biodegradable. Removes grease, oil, asphalt, corrosion, ink, lipstick, labels, permanent marker, crayon, wax, tree sap, pine tar, carbon, nail polish, red wine, smoke, carbon, soot, and scuff marks. Cleans dry erase boards, grills, jewelry, and stainless steel. Lubricates bike chains, motor cycle chains, locks, bearings, trimmers, clippers, hinges, garage doors, sliding doors, valves, cables, gears and sewing machines. Penetrates and frees the most difficult rusty nuts, bolts, valves, gears, cables and chains. Powerful penetrating formula that removes rust, oil, grease, tar, asphalt, pine tar, tree sap, ink, hair spray, nail polish, graffiti, labels, adhesives, permanent marker, crayon, wax, smoke, soot, scuff marks, and stains from red wine and drinks. Efficiently and effectively dissolves the most difficult rust covered nuts, bolts, valves, locks, chains, cables, rollers, garage door rollers, sliding doors, and anything else that may be stuck in place. Acts as a very smooth all-purpose lubricant for machines, appliances, and household items which include: hinges, locks, valves, chains, bearings, sliding doors and garage doors, tools, sewing machines, trimmers, and sporting goods. 2017 Retailers' Choice Award winner at the National Hardware Show in Las Vegas. The award is given for the most innovative product likely to be an industry wide best seller in years to come. USDA Certified as a BioBased product. It is Non-hazardous, non-corrosive, nontoxic, non-flammable, environmentally safe, water safe, and safe to use around children or pets. Perfect for indoor and outdoor use. 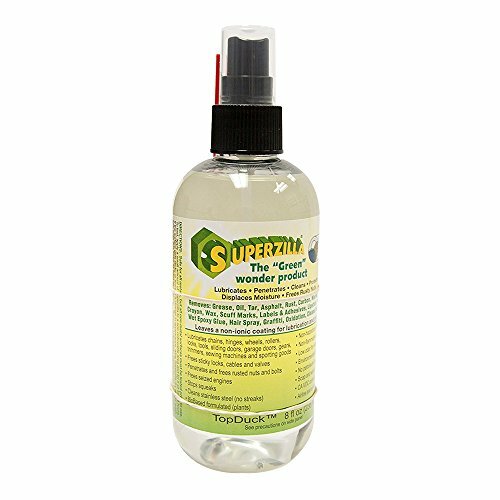 If you have any questions about this product by Superzilla, The "Green" Wonder Product, contact us by completing and submitting the form below. If you are looking for a specif part number, please include it with your message.